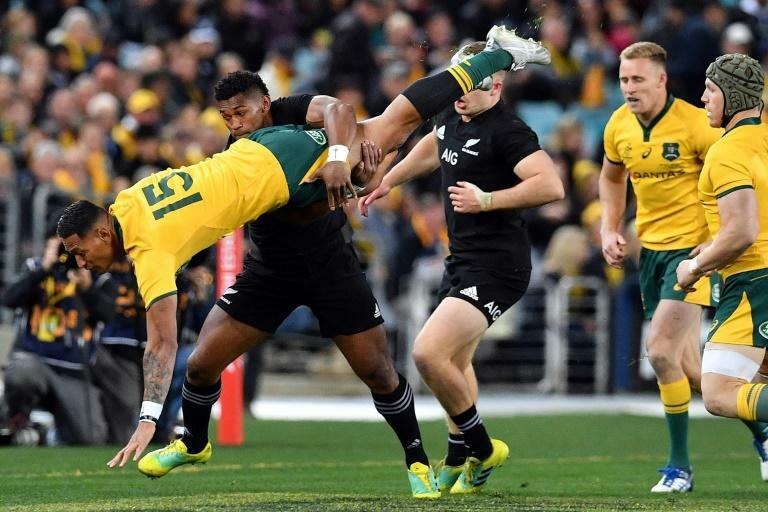 Winger Waisake Naholo scored a double as New Zealand recovered from a slow start to overrun Australia 38-13 Saturday and extend the Wallabies' Bledisloe Cup jinx in Sydney. The world champions scored six tries to one in the first Test, which also doubles as the Rugby Championship opener, for their third win at ANZ Stadium in as many years. Australia's hopes of claiming the Bledisloe for the first time since 2002 now rest on winning the second Test of the three-match series next week at Eden Park, where they have not tasted victory since 1986. All Blacks captain Kieran Read admitted the Wallabies dominated the first half, with his team trailing 6-0 until Aaron Smith's opening try in the 39th minute. But he praised his team's response when they ran rampant with a five-try blitz after the break. "It was a bloody tough Test match, credit to the Wallabies for what they came up with," he said. Australia's makeshift pack struggled at the set piece, turning over the ball at the lineout and conceding penalties at scrum-time. The result was all-too familiar for Wallabies coach Michael Cheika, who said his side needed to stick to their game plan in the face of another All Blacks onslaught. "When it goes against us like that we need to keep going... we defended excellently in the first half and we needed to keep doing that," he said. Australia missed 40 tackles to New Zealand's 11 and only hit the mark in five of their 12 lineouts, gifting the All Blacks possession. "It's really disappointing to get down the other end and throw the ball away," captain Michael Hooper said. The Wallabies are sweating on Folau's fitness for Auckland after he limped off in the 65th minute. All Black centre Ryan Crotty was knocked cold in a clash of heads with teammate Jack Goodhue and wing Rieko Ioane is expected to miss the Auckland match with a strained hamstring. As expected, Australia unleashed their potent backline early, desperate to put on a show for the crowd of 66,000 Sydneysiders. Naholo was fortunate not to be sinbinned for a lifting tackle on Israel Folau and the New Zealanders committed uncharacteristic handling errors under pressure from Australia's rushed defence. The All Blacks did not seriously threaten until the half hour mark, when winger Dane Haylett-Petty denied Naholo with a try-saving tackle on the line. Naholo then turned creator when his smartly taken inside pass set up Aaron Smith for the first try of the match. However, fly-half Beauden Barrett missed the conversion and the Australians went into the break up 6-5. Barrett made no mistake adding the extras when Jack Goodhue scored the All Blacks second just after the restart, giving them the lead for the first time at 12-6. New Zealand then ran away with the match after Haylett-Petty dropped the ball in front of Barrett, who soccered it forward for a try then added the conversion. Lock Brodie Retallick gave the All Blacks a fourth after a Barrett run put his team on the attack, with the hulking winger using a dummy pass to fool the Australian defence before crashing over the line. Jack Maddocks scored a consolation try for Australia after making his international debut from the bench but Naholo responded with two tries in two minutes to complete the All Blacks' late surge.